Imagine that The Hunger Games and Divergent series got together and had a baby. That was what The Testing was like. It was a smashup of everything you enjoyed from Tris/Four and Katniss/Peeta with a bit of newness to keep things fresh. Right away you will notice similarities. They are undeniable. Dystopian setting, factions ("colonies" this time around), special skills, select kids fighting it out until the bitter end, corrupt government, etc. You get the picture. As I was reading, it was hard not to think about the other books because so many things reminded me of them. To be honest, at times I was tired of reading because it felt old. Luckily, there were a few differences that kept this from feeling too stale and repetitive. First, Cia is different. She is not fierce like Katniss and Tris. She is a thinker with a compassionate side. Her inner instincts are not to kill or fight to the bitter death. As you can imagine, that makes her situation very different. Her love interest, Tomas, is very different as well. He has the devotion of Peeta and the secrets of Four. He's not as moody, but there is something different about him. Unfortunately, you really don't discover what it is in The Testing. You'll have to read book two! Another difference to this "game" or test that the characters are facing is pretty solid. There is an academic element to the selection process. 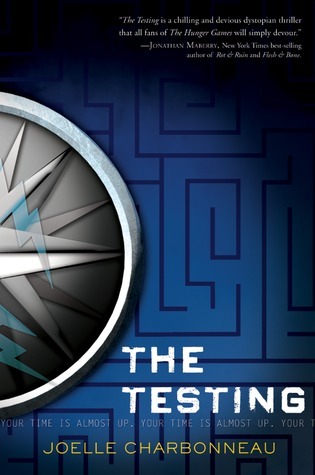 The purpose of the testing reminds me of the factions in Divergent, but I can see how things will be different as the story plays out. I was also glad to see the world building in this one. The land has been ravished by mankind. Four years of physical war was followed by three years of war by natural elements. After the Seven Stages of War, everything is destroyed and it's not coming back any time soon. The land cannot sustain life and the radiation from nuclear blasts have left many things mutated and dangerous. The perils the University candidates face during their testing is intense. I thought the writing of The Testing was solid. It was descriptive and detailed. The finer points of the plot were well thought out and executed flawlessly. Unfortunately, I still thought about The Hunger Games and Divergent/Insurgent as I read. If I had not read those series, this would be fantastic. I would be singing its praises of originality and uniqueness. But, instead of being original it came across more as a mash up of the other books, which took away from my response. I still enjoyed it, and I certainly want to read the other books. I hope they become more unique as the story continues to make this another strong contender in the dystopian genre. Great review! I didn't like this book, because of the Hunger Games similarities. I just couldn't focus on the story anymore because of them. In my opinion this book was just a bad copy of THG :( I'm glad you still enjoyed it, similarities aside. Even though I was almost constantly thinking of The Hunger Games, I think I enjoyed this one more just because it lacked the hype. I wasn't really reminded of Divergent, though, which is probably good, since I didn't much like Divergent.